The list of gymnasts accusing former team doctor Larry Nassar of sexual assault continues to grow. America's most successful Olympic gymnast Simone Biles has joined the MeToo movement revealing that she was molested by Nassar. "I am not afraid to tell my story anymore. 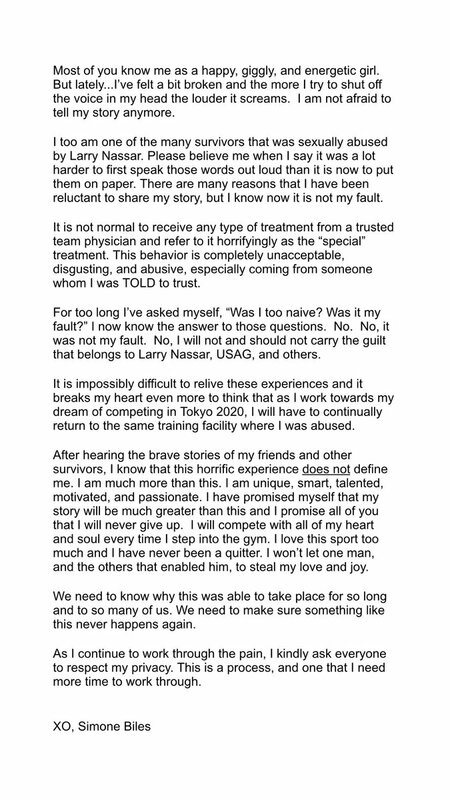 I too am one of the many survivors that was sexually abused by Larry Nassar," wrote the four time Olympic champion on Twitter. "Please believe me when I say it was a lot harder to first speak those words out loud than it is now to put them on paper. There are many reasons that I have been reluctant to share my story, but I know now it is not my fault." According to the lengthy post, Biles wondered if her assault was her fault or the result of being too naive. "No. No, it was not my fault. 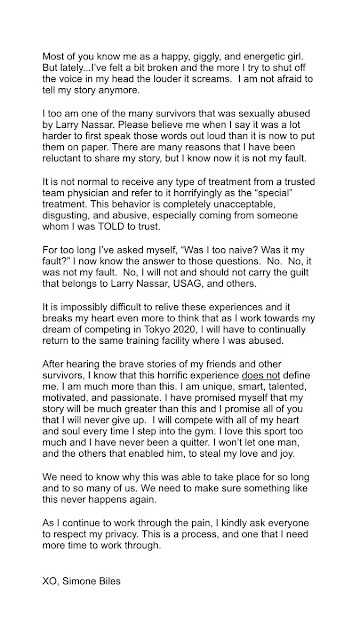 No, I will not and should not carry the guilt that belongs to Larry Nassar, USAG, and others." She expressed heartbreak over having to return to the same facility training where she was abused as she works towards her dream of competing at the 2020 Tokyo Olympics. The 20 year old gymnast vowed to never give up to compete with all of her heart and soul every time she steps into the gym. "I won't let one man and the others that enabled him to steal my love and joy." Biles asks her fans to respect her privacy as she works through the pain. She is the highest-profile athlete to lodge accusations against Nassar. Prior to Simone coming forward publicly, Aly Raisman, McKayla Maroney and Gabby Douglas were among the high-profile gymnasts to say they were also sexually abused by disgraced doctor. As part of our 2017 recap, here is our ten favourite vaults of the year. One of the best vaults of the year was Rebeca Andrade’s fantastically high Amanar last September. She is possibly the only gymnast who has ever competed an Amanar after tearing her ACL. Impressive! Jordan Chiles’ Amanar is also very impressive, high and with a very solid landing. Hopefully, she will be able to compete it at Worlds next year. The 2015 and 2017 vault World champion had an up and down season, but things came together at Worlds, where Maria Paseka managed to pull out one of her best Amanars to defend her title. Congratulations! A Level 10 gymnast only one year ago, Jade Carey came out of nowhere in 2017 and competed a huge Amanar. She has so much power that her landings are still a little out of control, but her height and poise are impressive. NCAA national champion Alex McMurtry performs arguably the best double-twisting Yurchenko in the world. Her height, distance and control on landing are unparalleled. One of the best vaults in the junior rankings is performed by Leanne Wong, who impressed with her height, precision and beautiful landings. Her form and lines are gorgeous to watch! The European all around champion performs a very clean and powerful DTY, she is beautifully consistent! Giulia Steingruber’s Rudi has become more and more consistent over the years, and last October it won her a bronze medal at the World Championships. Hard work pays off, congratulations! Kennedi Edney began her college career in January 2017 with a stuck one-and-a-half twisting Yurchenko, worth of a 9.950. At the NCAA Championships, she stuck the same vault again and was crowned vault national champion. The future looks bright! Senior Ashleigh Gnat was known for her beautiful DTY, one of the few in the NCAA. But before saying goodbye to gymnastics in May, she performed her first and only Amanar vault…and she landed it on her feet. A sweet goodbye at the end of a wonderful career, she will be missed! As part of our 2017 recap, here are our ten favourite uneven bars routines of the year. I am so proud of all that Nina Derwael achieved this year. European champion, World medallist, two historic records for Belgium, an incredibly intricate routine, an Ezhova… Wow, the future can but be bright! The next Russian star shines particularly on the uneven bars. Elena Eremina, European and World silver medallist, brought back to life the Nabieva release move, which she connects to a Pak salto and a Yao transition. Incredible! The 2017 World champion on bars retained the title she had shared in 2015 with three other gymnasts – on her own this time. Fan Yilin’s gorgeous bar work, especially her pirouettes, are a joy to watch, and, if she stays healthy, they will bring her many more medals! Luo Huan’s gorgeous bar routine is a treat no bars lover can miss. She links a Maloney to Pak to Maloney half, a somewhat unusual combination for a Chinese gymnast, but then she goes full Chinese with some incredible full pirouettes on one arm. Fantastic work! Another fantastic bars worker, Anastasia Iliankova has a unique routine, which shines for difficulty, execution and diversity. She was fourth at Worlds, but can achieve (and deserves) much more. Gabby Perea is still a junior, but her bar routine is worthy of an Olympic gold medal. She still needs some polishing work, but she has plenty of time, and then she is off to Worlds and Olympics with a bang. Georgia-Mae Fenton was the World Championships revelation on bars. She was unfairly left out of the bars final, but her routine has plenty of difficulty, great execution, and will bring her much success in the future. Riley McCusker had an unfortunate season, marred by a lot of injuries. Her bar work, however, is exquisite, and won her the U.S. national title on the uneven bars. If she gets back to full form, we shall see marvels. Ashton Locklear did not show her full difficulty on bars in 2017, leaving out her uniquely beautiful in-bar work. Her exquisite execution, however, gained her a spot in the bars final at the World Championships. Whatever the future has in store for her, her routine is one of the most beautiful to watch in the world. Uneven bars routines in the NCAA are beautiful to watch for their precision and stuck landings, but they are hardly gutsy and you rarely see huge moves. This, however, does not apply to senior Peng-Peng Lee, who performs a Ray, a Bhardwaj, a Maloney half and a double layout all in the same routine. She was rewarded with two well-deserved perfect 10.0s! As part of our recap of 2017, here are our ten favourite beam routines of the year. The gym gods fulfilled every beam fan’s prayers, and blessed us with Kara Eaker. Her routine is incredibly difficult, her execution flawless, her poise astonishing. She could easily be the next balance beam Olympic champion! Speaking of junior beam queens, Li Qi also has incredible difficulty and execution. She is a teeny tiny gymnast with incredible focus and poise. She also could be the next Olympic champion on beam. Oh dear, there is also a third junior gymnast who could be the next Olympic champion on beam. Maile O’Keefe has potential to win medals on virtually all apparatuses, but she shines particularly on beam. She already has difficulty, execution and maturity to compete with senior gymnasts. Watch out in 2018! Larisa Iordache is possibly the unluckiest gymnast ever, and she did not have the chance to compete her full difficulty on beam at the World Championships. But in the routine below, performed at the Romanian Championships, she hit both her full twists and her very difficult triple twisting dismount in combination. Sigh… I hope we shall have the chance to see her back to full strength again! U.S. national champion Ragan Smith was also very unlucky at the World Championships, getting injured in warmups just before the all around final. In qualifications, she also had a fall on beam, which left her out of the final. However, it is doubtless that Ragan is one of the best and most consistent beam workers in the USA and in the world. She will be back! A gymnast who instead achieved what she deserved this year was Pauline Schäfer, the 2017 World champion on balance beam. Pauline had the best routine of the World Championships to win the title, which included the cleanest execution and the most solid nerves. Hard work pays off, well deserved! Varvara Zubova is another junior gymnast who has incredible difficulty on beam. She was not included in the potential Olympic medallists group simply because Russia, beam and the Olympics have a very complicated relationship. But other than that, she has all the potential to medal on the big stage. Tabea Alt made a name for herself winning two World Cup all around titles in the spring of 2017. On beam, her best apparatus, she has plenty of difficulty, but what won her a bronze medal at Worlds was her ability to keep her nerves at bay and hit a clean routine. Well-deserved medal! The NCAA is not renowned for its difficult routines, but Katelyn Ohashi is fierceless (and an incredible gymnast). Her routine includes a triple series (BHSO + BH + back layout) and from time to time she also competes a layout with full twist. Impressive! Sarah Finnegan’s routine is not the most difficult you will see around (though sometimes she includes a triple wolf turn), but her form is exquisite, her toes perfectly pointed and her flexibility enviable. This is as beam should be competed. Hopefully next season Sarah will be awarded with a long overdue perfect 10.0! As part of our recap of 2017, here are our ten favourite routines of this year. The winner can but be our new floor exercise world champion, Mai Murakami, who finally achieved a long overdue world medal. Her routine is a combination of difficult yet flawless tumbling passes and engaging choreography. Impressive and deserved champ! I defined Leanne Wong the Queen of Elegance last September, when I was reviewing my ten favourite routines of the P&G Championships. Leanne is the perfect combination of difficult tumbling and picture-perfect choreography. Perfection is an underappreciated quality in elite gymnastics these days. Speaking of elegance, the most elegant gymnast at the 2017 World Championships was without any doubt Brooklyn Moors, who indeed won the Longines Prize for Elegance at those Championships. Her balletic style is poetry in motion, her floor routine is the real embodiment of artistic gymnastics. Kara Eaker, who is turning senior in 2018, cannot be left out of the ‘Queen of Elegance’ series. Leanne Wong’s club mate at GAGE, Kara’s lyrical beauty on floor and her rhythmic gymnastics style may bring tears to your eyes. There are so many Elegance Queens this year that the epitome of elegance on floor, Eythora Thorsdottir, has been relegated to fifth place! Eythora brings to the table new routines every year, and yet her beauty, flare and intensity never change. Respect! Speaking of intensity, Angelina Melnikova may not have had the year she had hoped for (and deserved), but during the floor event final at the European Championships in April, she found the focus and determination that had eluded her until then (and unfortunately later in the season). She performed a steady, beautifully and originally choreographed routine, which won her her first individual medal at Euros. Another well-deserved and overdue medal was the one won by Claudia Fragapane on floor at Worlds. Claudia’s dancing skills have improved dramatically since her appearance on Strictly Come Dancing, and her choreography, together with some steady tumbling passes, was a joy to watch. In a troubled year, nothing was more beautiful and refreshing than a floor routine that carried a strong message. Natalie Brown’s routine represented the tragic story of Syrian refugees. A humble gesture that reminds us how lucky we are. The all around world champion sealed her crown with this routine. Harry Potter fan Morgan Hurd gave this routine a touch of magic, with gravity-defying tumbling passes and graceful choreography. A real hero with glasses! This year Olympic alternate MyKayla Skinner became the first NCAA gymnast to compete a double double on floor exercise. This sassy routine shows the new MyKayla, who, unshaken by the many disappointments of her elite career, can finally enjoy herself, her gymnastics and some well-deserved glory in college. 2017 was a sad year for gymnastics. It will be remembered as the year of the sexual abuse scandal that involved USA Gymnastics doctor Larry Nassar, and of the unacceptable attempts by USA Gymnastics to cover up Nassar’s crimes, its own ineptitude to protect athletes and its dirty conscience. We pay respect and we support all victims, more and less famous, among which are Rachael Denhollander, Jamie Dantzscher, Mattie Larson, McKayla Maroney, Aly Raisman, Gabby Douglas and rhythmic gymnast Jessica Howard. We hope that the scandal and the suffering of all the victims will lead to a new culture in the sport of gymnastics, in which the health, well-being and happiness of the gymnasts will come before any results and personal gains. The other sad aspect of 2017 was that it was a year marred by an incredible number of injuries, which prevented many talented gymnasts from achieving deserved results. Romania’s Larisa Iordache, U.S. Ragan Smith and Brazil’s Rebeca Andrade got injured just before or during the World Championships in October. Great Britain’s Ellie Downie underwent surgery in summer and could not compete at Worlds. 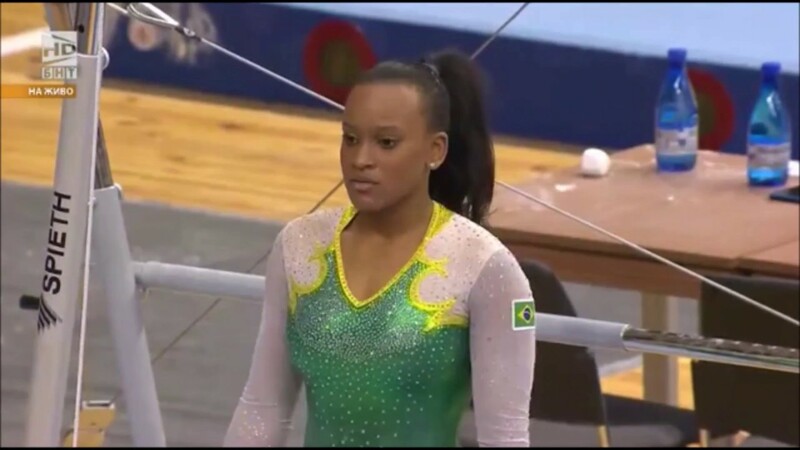 Brazil’s Flavia Saraiva got injured before Worlds. And Italy’s Vanessa Ferrari tore her Achilles during the floor final at Worlds. 2017 also saw some heartbreaking retirements. Olympic champion Cătălina Ponor bid farewell to gymnastics after a disappointing World Championships, extinguishing the last flame of the golden age of Romanian gymnastics. China’s Shang Chunsong retired after not being named to the World Championships team. She left gymnastics with much fewer medals than she deserved. NCAA super talented juniors Madison Preston of UCLA and Sabrina Schwab of Utah both put an early end to their college careers due to recurrent injuries. U.S. talents Jazmyn Foberg and Christina Desiderio also both announced that their bodies could not handle elite gymnastics any longer, and went to college one year early, Jazmyn to Florida and Christina to LSU. So what was left in 2017? What was left was a lot of surprises, some new faces and some long-overdue victories. At the European Championships in April Great Britain’s Ellie Downie became the first British gymnast to win the all around title, ahead of Hungary’s Zsófia Kovács and France’s Mélanie de Jesus dos Santos. History was also made by Nina Derwael, who became the first Belgian woman to win an uneven bars gold medal at the European championships. Long overdue medals were achieved by the Netherlands’ Eythora Thorsdottir, who won a silver on beam and a bronze on floor, and by Russia’s Angelina Melnikova, who pulled out her best ever floor routine to win the floor title. 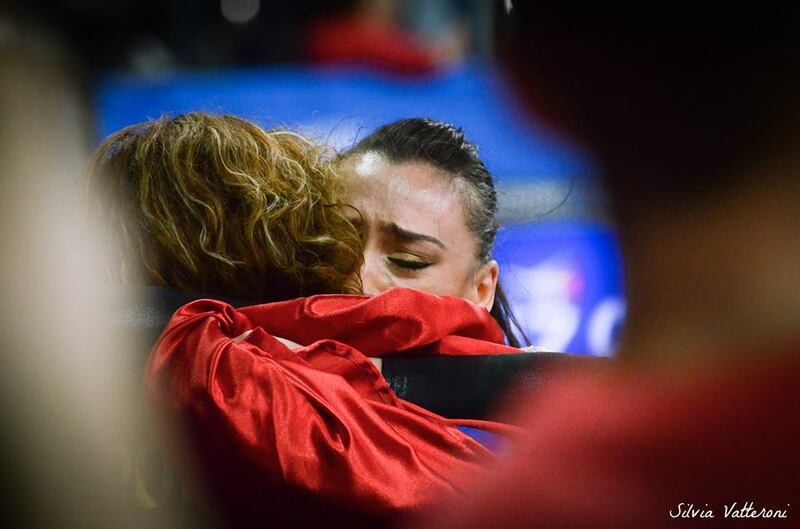 On beam, Romania movingly raised its head to win the title with Cătălina Ponor (at its fifth European victory on this apparatus) and a bronze medal with Larisa Iordache. France’s Coline Devillard won a surprising title on vault. 2017 saw the senior international debut of some very talented gymnasts. Elena Eremina was Russia’s best gymnast in 2017. She won a silver medal on bars at the European championships, and a silver medal on bars and a bronze medal in the all around at the World Championships. Another impressive debut was U.S. Jade Carey’s, who won two silver medals, on vault and floor, at the World championships, her first ever international competition. Impressive on bars was also Russia’s Anastasia Iliankova, who battled through injuries to finish fourth at Worlds on that apparatus. Another sensational international debut was that of 2017 World all around champion Morgan Hurd of the United States. Morgan came into the World championships as the underdog of Team USA, which included two Olympic alternates, but due to some luck and lots of nerves, she managed to win the title. She was also later congratulated by her favourite author J.K. Rowling! The World championships in October was a disappointment on many levels. There was no sensational debut as Simone Biles’ in 2013, the level of gymnastics was good but not exceptional, old champions seemed out of shape and injuries were rampant. That said, however, a few gymnasts managed to finally get the medals they deserved, and overall, it was an exciting and unpredictable competition. Canada’s Ellie Black and Belgium’s Nina Derwael made history for their respective countries, Ellie by becoming the first Canadian gymnast to win an all around medal (a silver), and Nina by becoming the first Belgian gymnast to win a medal at the World championships (a bronze on bars). Three gymnasts managed to snitch a long overdue medal. Japan’s Mai Murakami, after disappointing fourth-place finishes on beam and in the all around, finally won a gold medal on floor (Mai Murakami is a World champion, woohoo! ); Switzerland’s Giulia Steingruber won a bronze medal on vault to add to her bronze Olympic medal from 2016 (and she and Maria Paseka became BFF! ); and Great Britain’s Claudia Fragapane managed to win a bronze medal on floor. Two gymnasts impressively retained their titles against all odds: Russia’s Maria Paseka on vault and China’s Fan Yilin on bars (this time on her own!). Germany impressed on beam, where it won two medals. Pauline Schäfer, the 2015 bronze medallist, won gold with the best routine of the championships, and Tabea Alt won bronze. Among the surprises of 2017 was the immense depth and talent of the U.S. junior squad. The depth of Team USA is no surprise, but the United States is building a group of athletes who are both powerful and elegant, good tumblers and impressive dancers. Credit goes to the coaching staff, as well as the incredible commitment of the young athletes. Hopefully they will be raised in a safe and healthy environment, and will achieve their dreams at an acceptable cost. Among the talented group of gymnasts are U.S. all around champion Maile O’Keefe, U.S. floor champion Emma Malabuyo, U.S. beam champion Kara Eaker, U.S. vault champion Leanne Wong, as well as Gabby Perea, Adeline Kenlin, Sunisa Lee, Audrey Davis, Olivia Dunne and others. Another pleasant surprise was the comeback of Russia’s stars Aliya Mustafina, who had a baby girl earlier this year, and Viktoria Komova, who is coming back from injury. They both seem very motivated and excited to be back. The NCAA saw two Olympic champions compete in college for the first time. These were Kyla Ross and Madison Kocian, both for UCLA. Kyla Ross went on to be named Pac-12 Gymnast of the Year and to win two NCAA National titles, on bars and beam. A huge number of talented elite gymnasts also joined college gymnastics in 2017. These included Olympic alternate MyKayla Skinner for Utah, who tied for the NCAA floor title in April and became the first college gymnast to compete a double double on floor, fan favourite Maggie Nichols for Oklahoma, who led the all around ranking all season, Olympian Ruby Harrold for LSU, Olympic Trials participants Amelia Hundley and Rachel Gowey for Florida, and U.S. national team members Maddie Desch for Alabama and Sabrina Vega for Georgia. Oklahoma won its third national title in April, ahead of LSU (I’m still heartbroken, 2017 was their year!) and Florida. Oklahoma may not have a lot of internationally renowned names, but they are incredibly consistent, they stick landings and they hit beam – always. Credit and respect goes to head coach K.J. Kindler for building such an incredible programme. LSU’s freshman Kennedi Edney had an impressive season and was crowned NCAA champion on vault. UCLA’s freshman Kyla Ross won beam, and the floor title was shared by Utah’s freshman MyKayla Skinner and LSU’s senior Ashleigh Gnat. The bars title was shared among six gymnasts for the first time: Maggie Nichols and Nicole Lehrmann (Oklahoma), Kyla Ross (UCLA), Alex McMurtry (Florida), Sarah Finnegan (LSU) and Katie Bailey (Alabama). The all around crown was won by Florida’s Alex McMurtry, who inherited the title from her teammate Bridget Sloan, ahead of MyKayla Skinner and Alabama’s Kiana Winston. Alex McMurtry was also the winner of the prestigious Honda Award, while LSU’s Ashleigh Gnat was the recipient of the AAI Award, awarded to the best senior gymnast in the country. Among post-season and pre-season surprises, the main one is the replacement of Georgia head coach Danna Durante with former Georgia superstar Courtney Kupets-Carter, who was accompanied back to Georgia with former legendary head coach Suzanne Yoculan. We shall see what the dream duo can do! Another surprise is the immense talent Florida is bringing in for the 2018 season: Alyssa Bauman, Jazmyn Foberg and Megan Skaggs are all on the Gators’ roster for next year. Wow! In another surprising move, Stanford fired head coach Kristen Smyth, and replaced her with former Cardinal standout Tabitha Yim. The Cardinals have also welcomed a ton of new freshmen, to start the new season from scratch and forget last year’s disastrous finish. 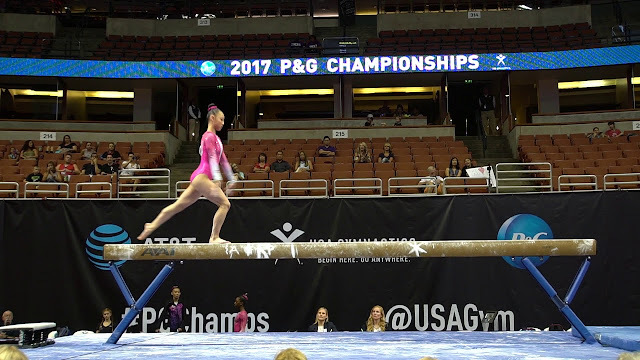 Final significant surprise, check out Kyla Ross’s new dismount on bars – a full-twisting double layout! In other gymnastics related news, congratulations to Russian stars Aliya Mustafina, Ksenia Afanasyeva and Ksenia Semenova, who all became mothers for the first time this year. Congratulations also to 2004 Olympic champion Carly Patterson and 2004 Olympic medallist Courtney Kupets-Carter, who gave birth to two healthy baby boys this year. And congratulations to Utah’s Makenna Merrell (now Merrell-Giles) and West Virginia alumna Brooklyn Doggette who got married in the summer. Finally, if you are up to procrastination and you have already watched all of the NCAA pre-season meets, you can have a look at Simone Biles’ appearances in Dancing with the Stars from earlier this year. 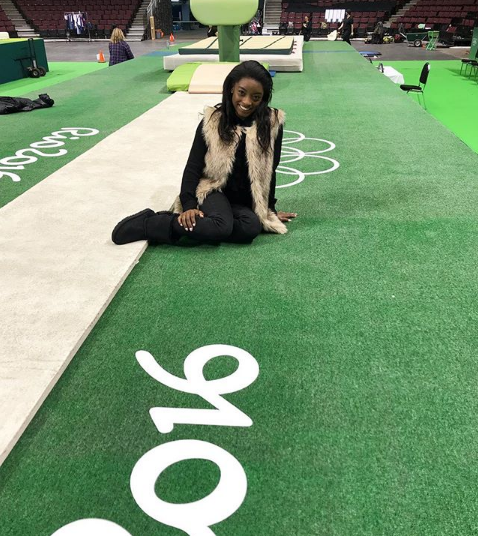 Simone Biles is also officially back in the gym, so who is excited for 2018? !